Thus spoke the Maid, as we rushed the tower of the boulevard, the English flying this way and that before us. The Maid found herself face to face with the commander–that Sir William Glasdale, who had called her vile names a few days before, and had promised to burn her for a witch if once she fell into his hands. But she had no ill words for him, as she saw him, sword in hand, seeking to make a last stand upon the drawbridge leading to Les Tourelles. But he would not listen; his face was black like a thundercloud, and with his picked bodyguard of men, he retreated backwards, sword in hand, upon the bridge, seeking to gain the other tower, not knowing its desperate condition, and hoping there to make a last stand. But he was not destined to achieve his end. Suddenly the bridge gave way beneath his feet, and he and his men were all precipitated into the water. It looked to us as though a miracle had been wrought before our eyes; as though the gaze of the Maid had done it. But the truth was afterwards told us, that a fire ship from the city had been sent across and had burned the bridge, cutting off the retreat of the English that way. And now we heard the din of battle going on within Les Tourelles; for La Hire had crossed the repaired bridge with a gallant band of soldiers, and our men, hearing the shouts of their comrades, and the cries of the trapped English, flung themselves into boats, or swam over, sword in mouth, anything to get to the scene of the fray; whilst others set to work with planks, and whatever they could lay hands upon, to mend the broken drawbridge that they might swarm across into Les Tourelles and join in the final act of victory, that should free Orleans from the iron grip in which she had been held so long. But the face of the Maid was troubled, as she looked into the dark water which had closed over the head of Glasdale and his men. She had seized upon a coil of rope; she stood ready to fling it towards them when they rose; but encased as they were in their heavy mail, there was no rising for them. Long did she gaze into the black, bloodstained water; but she gazed in vain; and when she raised her eyes, I saw that they were swimming in tears. These were the first words I heard the Maid speak after her wonderful victory had been won; and whilst others went hither and thither, mad or drunk with joy, she busied herself about the wounded, making no distinction betwixt friend or foe, sending urgent message into the city for priests to come forth and bring the last Sacraments with them, and so long as there were any dying to be confessed or consoled, or wounded to be cared for and transported into the city, she seemed to have no thought for aught beside. Thankful joy was indeed in her heart, but her tender woman’s pity was so stirred by sights of suffering and death that for the moment she could think of nothing else. Thus the daylight faded, and we began to think of return. How shall I describe the sight which greeted our eyes in the gathering dusk, as we looked towards the city? One might have thought that the English had fired it, so bright was the glare in which it was enveloped; but we knew better. Bonfires were blazing in every square, in every open place. Nay, more, from the very roofs of tower and church great pillars of flame were ascending to the heavens. Joy bells had rung before this, but never with such a wild jubilation, such a clamour of palpitating triumph. The city had gone mad in its joy–and it was no marvel–and all were awaiting the return of the Maid, to whom this miraculous deliverance was due. Eight days–eight days of the Maid–and the seven-months’ siege was raised! Was it wonderful they should hunger for her presence amongst them? Was it wonderful that every house should seek to hang out a white banner in honour of the Angelic Maid, and her pure whiteness of soul and body? “I will come to you by the bridge,” had been her own word; and now, behold, the bridge was there! Like Trojans had the men worked beneath the eagle eyes of La Hire. An army had already crossed from the city; now that their task was done, the Maid’s white charger had been led across, and the cry was all for her, for her; that she should let the people see her alive and well, now that her task was accomplished and Orleans was free! She let us mount her upon her horse, and D’Aulon marched in front with the great white standard. Weary and white and wan was she, with the stress of the fight, with the pain and loss of blood from her wound, above all, with her deep, unfailing pity for the sufferings she had been forced to witness, for the souls gone to their last account without the sacred offices of the Church. All this weighed upon her young spirit, and gave a strange, ethereal loveliness to her pale face and shining eyes. Methought she seemed almost more like some angelic presence in our midst than a creature of human flesh and blood. The Generals formed an advance guard before her. The soldiers followed, rank behind rank, in the rear. We of her household rode immediately in her wake, ready to protect her, if need be, from the too great pressure of the crowd. And so we crossed the hastily-repaired bridge, and entered by the Bride Gate–or St. Catherine’s gate, as it was equally called; for a figure of St. Catherine stands carved in a niche above the porch, and I saw the Maid glance upwards at it as she passed through, a smile upon her lips. Shall I ever forget the thunder of applause which fell upon our ears as we passed into the city through the bridge? It was like the “sound of many waters"–deafening in volume and intensity. And was it wonder? Had not something very like a miracle been wrought? For had not rumours reached the city many times that day of the death of the Deliverer in the hour of victory? None well knew what to believe till they saw her in their midst, and then the cry which rent the heavens was such as methinks is heard but once in a lifetime. The people were well-nigh mad with joy; they rushed upon her to kiss her hands, her knees, the folds of her banner, the neck or the flanks of her horse. In the red glare of the hundred bonfires the whiteness of her armour seemed to take a new lustre. The rent upon the shoulder could be plainly seen, showing where the arrow had torn its way. Women sobbed aloud as they looked; men cursed the hand which had shot the bolt; all joined in frantic cheers of joy to see her riding alone, erect and smiling, though with a dreamy stillness of countenance which physical lassitude in part accounted for. It was not far to the house of the Treasurer, and there in the threshold stood the little Charlotte, a great wreath of bay and laurel in her tiny hands. She was lifted up in her father’s strong arms, and ere the Maid was able to dismount from her horse the little one had placed the triumphal wreath upon her fair head. O, what a shout arose! It was like the mighty burst of some great thunderstorm. The Maid, blushing now at the tumult of applause, stretched out her arms, took the little one into them, and held her in a close embrace whilst she bowed her last graceful thanks to the joy-maddened crowd. Then she slipped from her horse, and holding the little one fast by the hand, disappeared into the house, whilst the people reluctantly dispersed to hear the story all over again from the soldiers pouring in, each with some tale of his own to tell of the prowess of THE MAID OF ORLEANS. They said she slept like a child that night; yet with the early light of day she was up, kneeling in the Cathedral with her household beside her, listening to the sound of chant and prayer, receiving the Holy Sacrament, the pledge of her Lord’s love. Not until we had returned from that first duty did she listen to what was told her anent the movements of the English. They were drawn up in battle array upon the north side of the river, spoke those who had gone to the battlements to look. Thinned as were their ranks, they were still a formidable host, and from the menace of their attitude it might be that they expected the arrival of reinforcements. Would it not be well, spoke La Hire, to go forth against them at once, whilst the soldiers’ hearts were flushed with victory, whilst the memory of yesterday’s triumphs was green within them? Then turning to me, she bid me go to the Bishop, and ask him to give her audience; and shortly she was ushered into his presence, and we waited long for her to reappear. How shall I tell of the wonderful scene which the sun looked down upon that bright May morning, when the purpose of the Maid became fully revealed to us? Even now it seems rather as a dream, than as an incident in a terrible war. Out upon the level plain, in full sight of the city, in full view of the serried ranks of the English army, a great white altar was set up. The army from Orleans marched out and stood bareheaded beneath the walls, unarmed by order of the Maid, save for the small weapon every man habitually carried at his belt, citizen as well as soldier. The townspeople flocked to the walls, or out into the plain, as pleased them best; and from the Renart Gate there issued forth a grave and sumptuous procession; the Bishop in his vestments, accompanied by all the ecclesiastics within the city walls, each of them robed, attended by acolytes swinging censers, the incense cloud ascending through the sunny air, tapers swaying in the breeze, their light extinguished by the brilliance of the sunshine. The Maid in her white tunic, with a white mantle over her shoulders, followed with bent head, leading the little Charlotte by the hand succeeded by her household. And there, in the sight of the rival armies, High Mass was celebrated by the Bishop, both armies kneeling devoutly, and turning towards the Altar as one man. Never have I witnessed such a scene. Never shall I witness such another. The Mass over, the procession filed back through the gate, both armies kneeling motionless till it had disappeared. Then the Maid rose, and we with her, and followed her in its wake, and the French army, in perfect order, re-entered the city by the appointed gates, as had been ordered. One hour later and the Maid sent D’Aulon up to the battlements to look what the English army was doing. He returned to say that they were still drawn up in rank as before. “Which way are their faces?” she asked. “Their faces are turned away from the city,” was the reply. The countenance of the Maid brightened with a great light. And so, without further battle or bloodshed, the English army marched away from Orleans; and upon the next morning not a man of the foe was left; and the citizens pouring out from the town, destroyed, with acclamations of joy, those great bastilles, which had so long sheltered the foe and threatened the safety of the city. It was a day ever to be remembered. The bells pealed ceaselessly, the houses were decked with garlands, white banners or silken pennons floated everywhere, the townsfolk arrayed themselves in holiday garb, and poured out through the gates to wander at will over the plain, so lately held by the English. Gladness and the wonder of a great relief was stamped upon every face, and constantly songs of triumph arose or thunders of applause, of which the burden always was–THE MAID OF ORLEANS! THE MAID OF ORLEANS! They would have kept her with them for ever, if it might so have been. They talked wildly, yet earnestly, of building her a palace, where she should live at ease all the rest of her days, the object of universal admiration and homage. But the Maid listened to such words, when repeated to her, with a dreamy smile. Her wound required rest; and for two days she consented to remain quiet in the house of the Treasurer, lying for the most part upon a couch in a great cool chamber, with the little Charlotte for her companion and playfellow. She sometimes rose and showed herself at a window in answer to the tumultuous shoutings of the crowd without; and she received with pleasure some great baskets and bouquets of flowers which the wives and children of the citizens had culled for her. But she gently put aside all suggestions of rewards for herself, which some would fain have bestowed upon the Deliverer, and which men of all ranks were but too ready to claim and receive for service rendered. And all the while she was eagerly desirous to return to the King, and urge upon him the need to repair instantly to Rheims, and there receive his crown. To her he was not truly King till he had been anointed as such. She knew that the blow to the English arms just struck must have a paralysing effect upon their forces, and that a rapid march with even a small army would be accomplished without resistance, if only it were quickly made. I need not say that the city of Rheims lay in the very heart of territory owning the English sway. To reach that city we must perforce march right through a hostile country, garrisoned by the enemy. But of that the Maid made light. 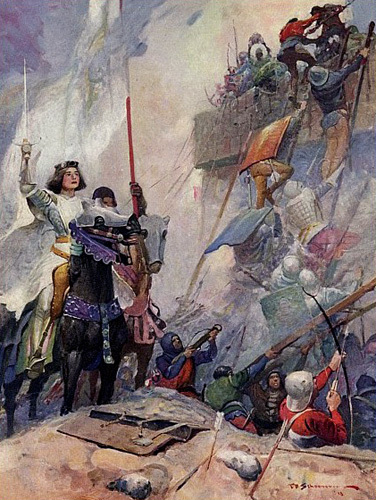 And so, before a week had passed, we set forth with the Maid to go to the King, who had by this time moved his Court from Chinon to Loches, another fortress upon the Loire, where there was space for his train, and which could, if necessary, be fortified against a siege. It was a strange journey–more like a triumphal progress than anything we had yet met with. The fame of the Maid and her miraculous exploit in the matter of the siege of Orleans had gone before her, and from every town or village through which she passed the people flocked out to see her, bearing garlands and banners, crowding about her, asking her blessing, seeking to touch her, pouring out blessings and praises, so that the heart of anyone less filled with the humility which comes from above must needs have been altogether puffed up and filled with pride. But it was never so with the Maid. Her gentle courtesy and devout humility never failed her. Lovingly and gratefully she received love and affection, but praise and honour she set aside, bidding all remember that to God alone belonged the issues from death, and that she was but an instrument in His mighty hands. We wondered how she would be received at the Court, and whether La Tremouille and her other adversaries had been convinced of her divine mission, and would now remove all opposition. As we approached the fortress we saw that flags were floating from every tower; that the place wore a festive aspect, and that the town was pouring out to welcome us and gaze upon the Maid. Then, with a great fanfare of trumpets, the gates of the fortress were flung wide open, and forth came a gay procession, in the midst of which, we could not doubt, rode the King himself. Yes, there was no doubt of it. The crowd parted this way and that, and we saw how the young King himself was marching towards us, and at the sight of the Maid, not only did every courtier in the train uncover, but the King himself bared his head, and bowed low to the MAID OF ORLEANS. She was off her horse in a moment, kneeling at his feet; but he raised her instantly, held her hands in his, gave her thanks with true emotion in face and voice, and, turning to her brothers, who rode amongst us of her household, he cried to them in loud tones, saying how he had decreed that the family of the D’Arcs should henceforth have the right to quarter the hues of France on their arms! An empty honour, perhaps, to simple peasants; and yet an honour that the proudest families in the land might envy! They carried her into the fortress. The two Queens and the ladies of the Court knew not how to make enough of her. They seemed to think that our coming must be regarded as the signal for an outburst of merrymaking and carousing, such as the King found so much to his liking. It amazed us to find him still wrapped in idle luxury, joyful, it is true, over the relief of Orleans, over the discomfiture of the English; but as indisposed as ever to take the field himself, or to put himself at the head of an army and march to his coronation as the Maid instantly urged him. But the King could not be persuaded; indolence and fear held him captive, whilst his traitorous advisers sought by every means to undermine the influence of the Maid. And although in this they were not successful, for he believed in her mission, admired her prowess, and looked to her for guidance and help, he must needs listen also to these others who were of contrary mind, and so the weary days dragged on, and nothing was done.